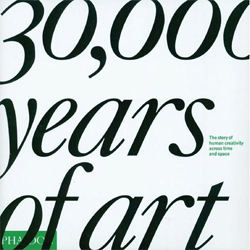 30,000 Years of Art documents the history of the field and leaves the theories behind. The people who put together 30,000 Years of Art: The story of human creativity across time and space were no fools. They realized that the preface, introduction, and justification would either have to be infinite or non-existent. They chose the void. Two pages into the book and you’re already looking at art. No discussion about what art is, what characteristics the works share, who chose the works, why they are representative. Nothing. There’s one brief statement running in a narrow column on the first full page. It says: “From the time when human beings can first be called human, they have felt compelled to depict themselves and their world — as gods, mortals, animals or abstractions.” It’s so broad as to say everything and therefore nothing at all. There is some evidence for my interpretation. 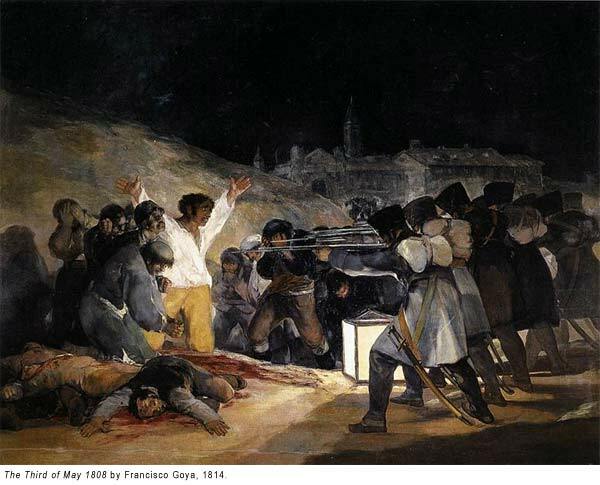 Art historians and the theorists of art have been at quiet war with one another for a long time. The theorists, per their nature, accuse the historians of “mere” scholarship. The historians, per theirs, accuse the theorists of airy speculation. But it is difficult for the historians to be vocal in their accusations. The central problem is that once you enter into the verbiage you’ve already given up a good deal of ground to the theorists. 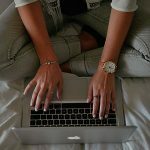 You’re fighting them on their turf and they’re going to get you tangled up in a morass of “whys.” It is as if entering into the debate at all is already to concede it. Silence, the mute labor of the scholar, is thus a potent weapon in itself. Plus, it drives the theorists to distraction, like dealing with a lover who returns your letters unopened. Gombrich was crotchety in a lovable and straightforward sort of way and he always stuck to a basic premise: Art is about image making. 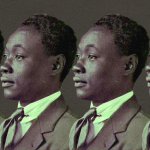 Those images, he thought, can either come from the “memory image” — the clear and precise idea we have of how things look — or from the “mimetic image” — the attempt to faithfully reproduce the look of things in sensual perception. Artists, in producing images, swing from one option to the other and the history of art is nothing but the “story” of individuals producing images according to their skill in one craft or the other. Period. The crucial thing about this view of art is that it obliterates periods. In fact, if you take his viewpoint to its logical conclusion you have to say that there isn’t really such a thing as a history of art at all. (Which makes sense, since Gombrich has already said that there is no such thing as art. A history of nothing, therefore, would merely be nothing times two.) There are simply a lot of different works, they got created over time, and some of them represent the apex of skill in making visual objects. And that, it is easy to see, is the hidden polemic behind 30,000 Years of Art. It is a book that doesn’t really believe in art with a capital-A at all. Indeed, “art” is in lowercase on the front cover. The book could just as easily have been called, 30,000 Years of Skilled Individuals Producing Things to Look At. The word “art” is just a placeholder for a longer and clumsier sentence. This anti-art-as-concept approach is heightened by the way that the works chosen for 30,000 Years are visually reproduced in the book. Every “art” object is shown floating in the middle of a white background, popping off the page as an image, pure and vibrant. An image. Sculptures, friezes, and objects, are, along with paintings, flattened out into an absolute, imagistic space. It’s beautiful but it’s weird. The idea that any of these works need to be seen in the context of the worlds in which they were created is utterly denied. They exist, instead, in a timeless place, a graphical version of the white box. The history of “art” moves forward from there. Cave paintings, figurines, implements, and so forth, all swimming in a sea of white, aided and abetted by the laconic prose, which gives straightforward descriptions of the whats and the wheres and the hows with the occasional bit of praise thrown in. “A Human Figure” from the Shang Dynasty in China (c. 1150 B.C. ), for instance, is described as “astonishing.” And it is. We are then told that, “The awe-inspiring effect of the head and face, with its huge eyes and ears and uncompromisingly set mouth, was re-emphasized by the elongated torso and the exaggerated arms and hands.” I am quite fond of the idea of an “uncompromisingly set mouth.” And it is uncompromising. It is a mouth that will not compromise. Still, notice how the enthusiasm of the first part of the sentence ultimately breaks down into the analysis of the craft at work. We get the emotional language of “awe-inspiring” and “huge eyes” and “uncompromisingly set mouth” in the first part. We’ve settled back down to a more clinical language with “re-emphasized” and “exaggerated arms” by the end. The whole point of 30,000 Years is not to get caught up in the mythos or the lure of “Art.” The point is to see art for what it is. To see the process and the procedures and the materials. To understand that the mystery is nothing more than what has always been mystifying about human skill applied at the highest level. 30,000 Years stays true to this spirit, a sense of awe that never allows itself to rise above the level of the mundane. The boldest thing about the book for the first 500 pages is the strength of this core conviction. There is an absolute refusal to rank or to organize except along the indifferent axis of temporality. The closest thing to a guide in the book is the timeline at the very end. 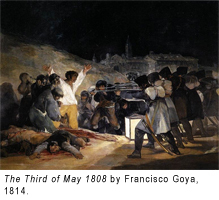 But all you get from that is a graph showing how different civilizations overlap over time, which helps to explain why “Sakalava Couple,” a relatively crude statue from Madagascar, is on the same page with Francisco de Goya’s “Third of May 1808.” It is extraordinary to watch this leveling instinct at work. There is a kind of historian’s revenge being exhibited on every page. The book is drunk with the power it wields in smashing through every received idea about “Art” and its “development.” It’s a stoic drunkenness no doubt, an inward and contained glee, but a form of drunkenness nonetheless. The glee can be heard in the whisper of the pages as you turn them and turn them: “no art, no development,” “no art, no development.” Every time a “primitive” work (“Seated Male Figure,” Papua New Guinea) is shown right next to a “sophisticated” European painting (“The Night,” Ferdinand Hodler), both are described with the same tone, the same emphasis, the same focus on image and on skill. And every time it happens another blow is being struck. No art, no development. 30,000 Years does its best to stay true to this line even through the hard times, the roughly 200 years that make up the time from then to now and which threaten to unravel the story that this book is trying to tell. To their credit, the folks at Phaidon stay strong. In fact, for being coy art historians, the editors practically stick it in your eye. 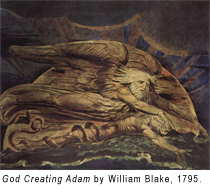 As we reach the late 18th century — the Gombrichian trouble spot — we find William Blake’s “God Creating Adam.” The problem with William Blake is that, while he was certainly a skilled craftsman, there’s also no question that he marks a shift toward the Romantic conception of “Art” that Gombrich and his successors at Phaidon are taking issue with. The task, then, is to bring Blake, and those like him, into the “no art, no development” framework of the book without upsetting the basic formula. The result is a text that pays lip service to Blake’s ideas about art and life (he is said to “interpret biblical and literary subjects according to his personal vision”) but then moves on rapidly to talk about material and technique. About “God Creating Adam,: the editors write: “as the culmination of the artist’s experimental methods, the composition is highly unusual for its date: antique source material is designed inside a two-dimensional patterning of forms and vividly embellished by unnaturalistic colours and light sources, a style that Blake had developed in the 1780s and 1790s.” The work immediately following Blake’s print in the book is a watercolor from India by an unknown artist, “Sri Krishna With the Flute.” The point being: no big deal, a little Blake, a little Sri Krishna, nothing to get excited about. 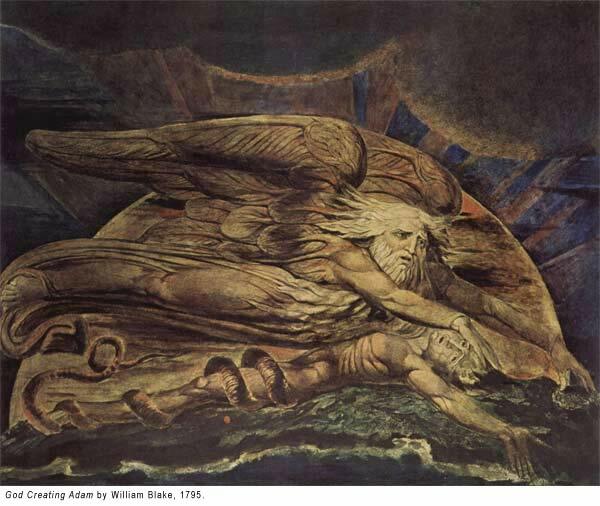 Whatever Blake’s high-flown ideas may have been, in the end, if he was an artist it is because he was an image-maker and if he is included in 30,000 Years it is because he was an image-maker of noted creativity and talent. No different, in essence, from the Korean painter Chong Suyong, whose “Nine Dragons Waterfall” comes two pages after Blake’s print and which is presented as an extraordinary example of the new realism, called the “true view,” that had a major impact on Korean art of the 18th century. 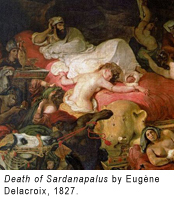 This cheekiness comes to a crescendo in the presentation of Delacroix’s “Death of Sardanapalus.” We’re told that Delacroix’s style was always changing but that “in this work, he abandons the polished finish of Neoclassicism in favor of a more open, loose brushwork.” The crucial difference between Neoclassicism and Romanticism is thus reduced to a differing approach to brushwork. No doubt someone toasted someone in the Phaidon editorial room in celebration of that bit of sass. To top it off, the editors follow “Death of Sardanapalus” with another masterwork in use of the brush, Tani Buncho’s “Dragon in Clouds,” a work of ink on silk from Japan in which we see the “sharp brushwork of the dragon contrasting starkly with the nebulous clouds.” Now pay attention to the brushwork, the editors are saying, and you won’t get lost in the sillier notions about art. Open another bottle of that wine. 30,000 Years of Art gives us art as craft and artists as artisans. If it’s true that 30,000 Years is an under-the-radar Gombrichian manifesto of sorts, a sneaky salvo in the guerilla war between the historians and the theorists, then the question of the transformation of art in its self-understanding and the demise of beauty is truly going to come to a head in the 20th century. If Romanticism and the late 18th century marks the beginning of Gombrich’s aesthetic headache, the early 20th century assault on image and craft is probably its full migraine status. 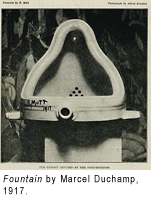 This can all be summed up with one specific object and one specific question: What in the world is 30,000 Years going to do with Marcel Duchamp’s “Fountain,” the factory–produced, ceramic urinal that Duchamp turned upside down, signed R. Mutt, and displayed as a work of art in an exhibit in 1917? It is a work that denies artistic skill in almost every way that Gombrich meant it. It is the quintessential challenge to the story of image and skill. This, in fact, is the question that Arthur C. Danto, the eminent art critic and philosopher, once posed as an attack on the Gombrich line. 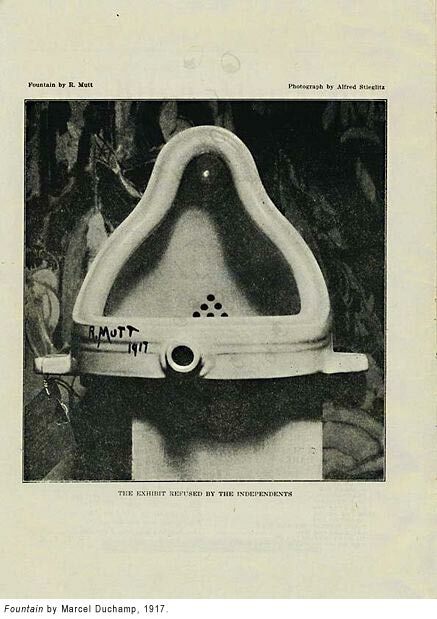 The fact, Danto noted, that Gombrich cannot account for works like Duchamp’s “Fountain” means that Gombrich’s claim that art is essentially about visual images breaks down once we get into the modern period. Art, Danto would point out, has changed. To ignore this fact would be to close one’s eyes to everything that has been happening in art for at least the last 150 years. Gombrich, of course, has a response to this. It’s a simple one. It can be summed up in one word: Nope. He didn’t buy it. Until the day he died, Gombrich never bought it for a moment. Art hasn’t changed a bit, he thought, because there was never such a thing in the first place. This is a devastating text in the degree to which it deflates claims simply by stating them. “Well,” you can hear the editors saying, “let’s just move on now and look at some more art.” The last sentence is particularly wonderful. The entire point of the 937 preceding pages of 30,000 Years of Art is that the questions “Who is an artist?” and “What is art?” aren’t very interesting and don’t lead you anywhere. The whole point of the book is that art isn’t about itself or about its own idea because there is no idea. So the editors don’t really have to say anything more. They don’t have to do anything but present the facts at hand. Duchamp’s “Fountain” is meant to be buried in the avalanche of craft and skill that constitutes the rest of the book and that will, one assumes, continue to pile up in the 30,000 years to come. 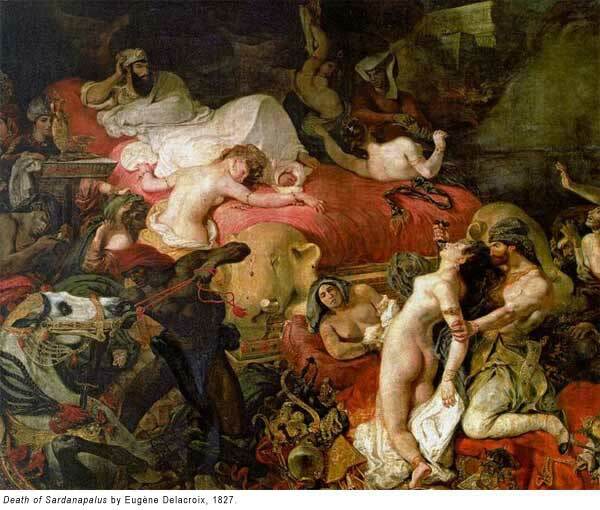 Gombrich once wrote: “I don’t believe that we have a moral duty to go with the times.” 30,000 Years of Art adds an exclamation point to that sentence. 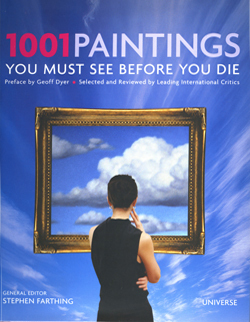 Nothing but a catalog, the book serves to obliterate time as a factor in considering art. Every work becomes, instead, its own sustainable universe, given one page to be what it is, shining out for a moment in irreducible particularity.